The list of things mice hate includes things found in nature as well as others created by mankind. A mouse's hatred of certain things may come from being fearful of it, being repelled by it or even being allergic to it. Anyone who wants to get on a mouse's bad side only need try a wide array of activities that will surely turn them off. Mice abhor lots of things, and there are several way to deter them from scrounging around your house. One way is to keep it clean, well swept and free from food particles and crumbs. This is especially important under appliances in the kitchen where foodstuff is known to congregate. In a clean house, mice have nowhere to hide. Mice are also not particularly fond of peppermint, camphor and pine tar, according to the book "Grandmother's Critter Ridder." The book says mice are actually allergic to peppermint, and cannot tolerate it saturated on cotton balls or even growing fresh in the garden. Planting certain plants will also make mice run for cover, the book said, including daffodil and hyacinth. Steel wool and fabric softener sheets are also on mice's hate list, the fabric sheets for the smell, the steel wool because it's impossible to chew through. While fabric softener sheets have not been around since antiquity, ways to repel mice have. Folks who lived along the Nile around 3000 BC used to believe they could convert mice and other pests into non-pesky, harmless creatures, according to an article posted on the site Cat.Instit.fr. The article says early hieroglyphics illustrating mutated animals proves that people honestly thought they were transforming the vermin into another type of critter. Mutating the mice didn't seem work for everyone, since other methods were used around 1413 BC in the Orient. Their methods included burning certain resins and drugs, which served a two-fold purpose, according to the article. This practice helped with both the people's spiritual ceremonies and fumigating out unwanted pests. The article says mice and rats were particularly offended and repelled by the fumes that spewed forth from heated gazelle dung. Mice also have a hatred of, or at least flee from and fear, animals that see the mice as a tasty snack. Cats are well known for catching mice, although not all cats get into the groove. Dogs, too, are usually up to the task of catching and killing a mouse, especially those specifically bred to hunt and kill small animals like rat terriers. Animals that feast on mice in the wild include owls, hawks, weasels, raccoons, snakes and skunks. 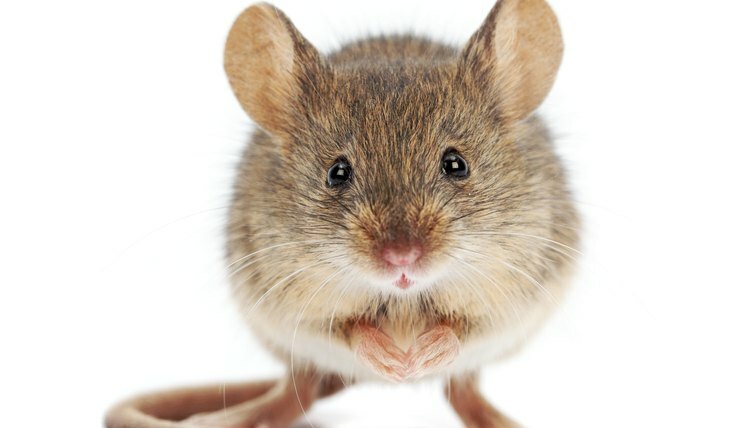 Mice are not all that loving towards people, whether in the home or in the wild, because they, too, are big, loud, clunky and often go out of their way to kill the furry little creatures. In addition to repellents, predators and a clean house, mice have a high dislike for a number of treatments. Picking a mouse up by the tail is sure to make an enemy of the critter. He will be startled and immediately try to wrap around and climb up your hand so the pressure is relieved. Folks who wish to keep mice as pets should know they do not appreciate being squeezed, crunched or crushed or stuck in a cage without little tunnels and other hiding places. Rolling them too quickly or over harsh terrain in those little rolly balls is another way to get mice on your bad side. Mice are sneaky and nocturnal, which means they despise bright lights, wide open spaces and any place they feel open and vulnerable. Just as mice hate a number of things, they, too are hated. The longstanding legend that elephants are deathly afraid of the little critters as actually true, according to several sources. The mythbusting Web site YesButNoButYes.com has a video it says proves this theory once and for all where a massive, powerful elephant goes out of his skin, or at least his way, to avoid a mouse. People, too, can develop such a hatred of mice that they actually fear them. This phenomenon is known as musophobia, murophobia or suriphobia and, although mice may hate being clumped together with their larger cousins, the phobia label also covers the fear of rats.